Beloved and I finally had dinner at Zensho a couple of days ago. I say finally because this is one of the couple remaining Japanese restaurants we have yet to try at Tomas Morato. Why we put off until now was probably because we had no idea what their “A la carte Buffet” mean. And while the 595 Php tag is a bit enticing, we didn’t know if this included their teppanyaki, which apparently what this resto is known for. After reading through the few reviews found on the web, we find out that this indeed include their teppanyaki, among other Japanese favorites. Since their sashimi was also included, it was a done deal. We were given a slip of paper to write our orders down. It had a list of their selection for the A la carte Buffet (595 Php for dinner/495 Php for lunch). It was a pretty generous offering that it was impossible to try it out with just the two of us. Instead, we ticked what we wanted, hoping for the best, not knowing fully what to expect since it didn’t have any visual aids and we were among the first ones to enter. Enter our first victim: Mixed Sashimi. It had, going clockwise from the top, tuna, crabsticks, salmon, and yellowtail. The taste wasn’t bad, but it’s not the freshest I’ve had. 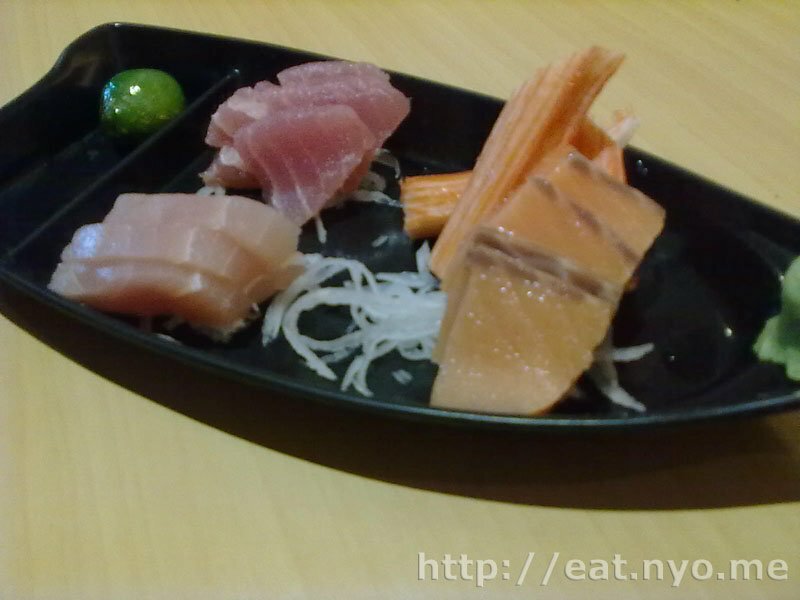 However, these bits were small—think half the usual size of sashimi. Good thing you can order as much as you want, and we had two more. 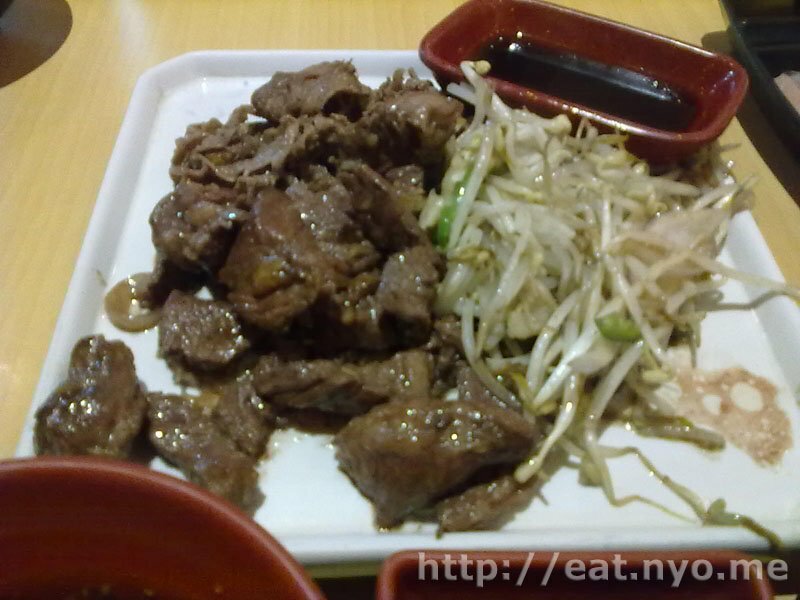 From their teppanyaki grill, they combined two of our orders: the Australian Steak and Sukiyaki Steak. The quantity of meat in this one certainly pleased me, but after a few bites of the although tender and juicy meat, I found it has too much garlic that it’s the only thing I can taste from the plate. Not that it’s bad, it’s just a taste that’s too easy to get tired from. 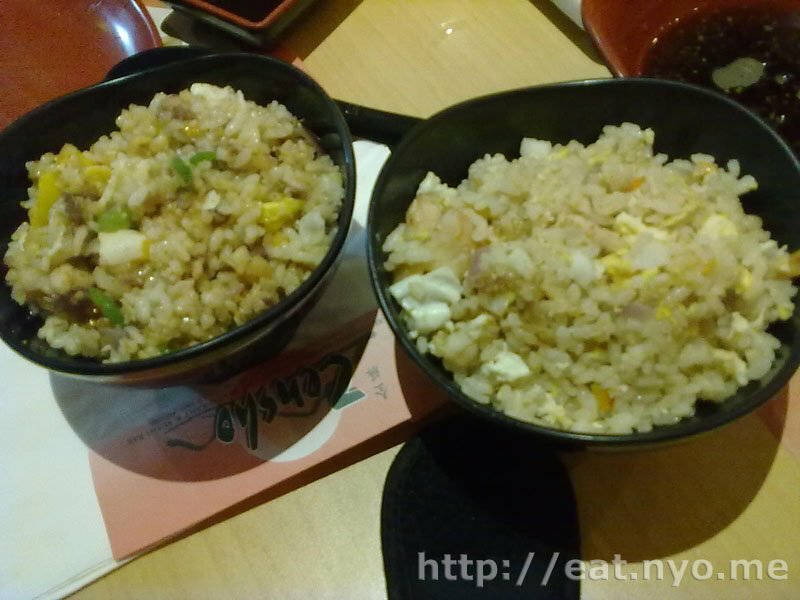 Especially if you have rice orders like ours—Mixed Fried Rice for me and Seafood Fried Rice for Beloved. Cooked in the same grill, mine was extremely garlicky. I didn’t get a chance to taste Beloved’s but I think she liked hers. The only thing I liked about this bowl is the serving is just right, and I’m able to gobble it up without filling too much of my stomach real estate. 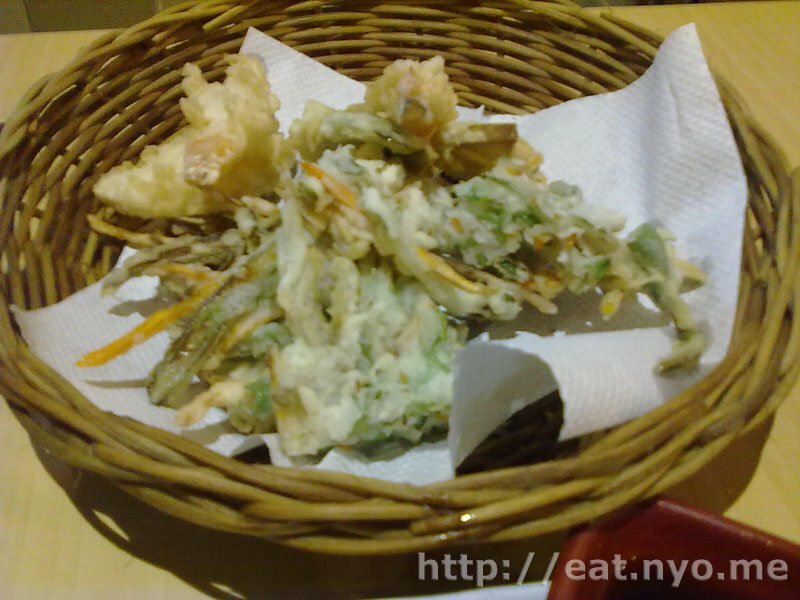 Next stop is their Mixed Tempura. It had shrimp, mixed vegetables, sweet potato, and bell peppers. It’s really not a bad basket, however, the size of the shrimp reflects its own name. This is probably the smallest shrimp tempura I’ve had. I loved the sweet potatoes, tough. This one surprised me—it’s Buttered Shiitake. It had a lot of said mushroom in flower form, and not just the cap. And, indeed, it was buttery—very buttery. However, it was also garlicky, making me think that this place wouldn’t bode well for vampires. Next is their Cha Soba. 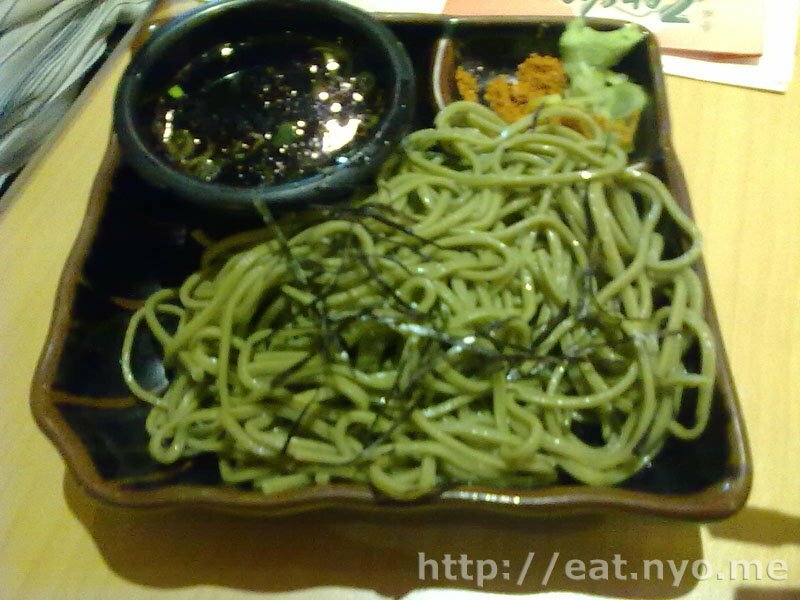 Well, I was already starting to get full when this arrived, but I’m pretty sure that this had quite a lot of noodles in it, with the usual nori strips and dipping sauce. Also, it was ice cold, just the way to enjoy it. Finally, although we ordered it in our first slip, our Oyster Motoyaki arrives. This is basically Japanese baked oysters, which we were really excited about since it’s been quite a long while since our last oyster. And we were very happy that there’s a lot of them, and each bivalve seems to have three pieces of meat in each. After trying it out, though, it turned out to be a disappointment. 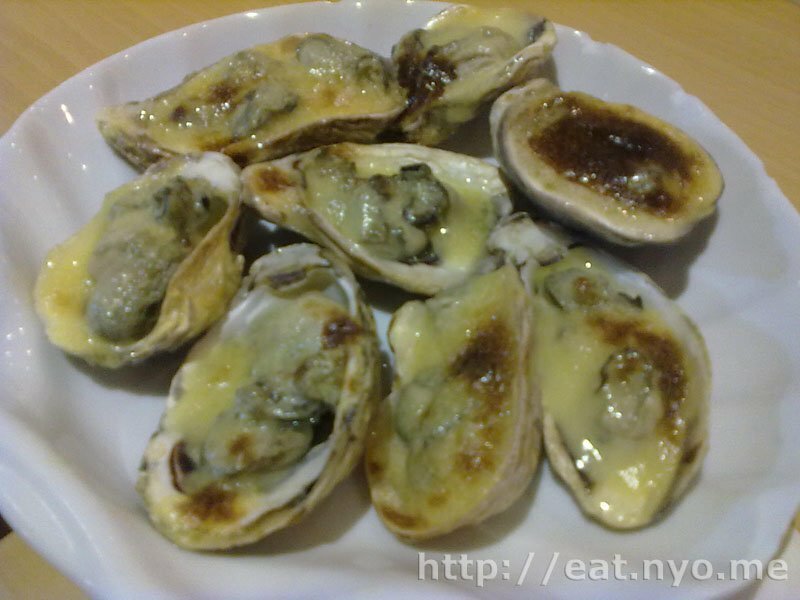 The oysters didn’t taste fresh at all, and the sauce was, well, it would’ve been better if it was something different. Maybe it was just our batch, but, unlike other reviews I’ve read, I will not recommend this one. But does that apply to all the food and to Zensho in itself? 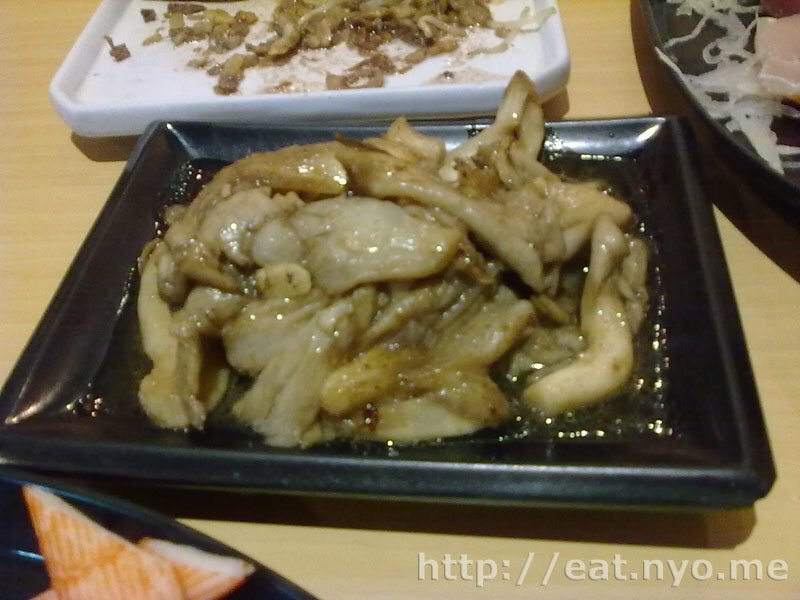 Well, I can conclude that this is not the best 595 Php Japanese buffet I’ve had. And while this is the only A la carte style buffet I’ve tried, I’d rather have my a normal buffet where I can see the food before I order it. Sure, this one is supposed to be fresher, but if fresher means more garlicky, I’ll pass. One thing that got me, though, is I got full. And although our bill was almost 1.5K due to service charge, we’ve been to places that cost us as much but didn’t get full at all, or not even having half the orders of what we had. But that’s not the deciding factor. The oysters were very terrible. There. Sorry. I had to say it. And since we had to pay double if we didn’t finish it up, we finished it against our will. I put off a couple of days before writing this review to see if we get any form of food poisoning. We didn’t. That being the deciding factor, Zensho barely, barely gets a passing grade from me. Budget: 500⁄600 Php per head. Not recommended for: Garlic haters. Smart nomnomnom tip: Go easy on the starch (rice or noodles).